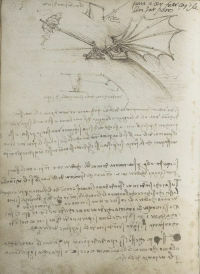 The key questions for Leonardo in his efforts to design a flying machine was how large the wings needed to be in order to lift a man into the air and keep him in flight. In this drawing, a model wing is anchored to a block of wood weighing 90 kilos (roughly the weight of a man). As the figure applies rapid downward pressure to the lever, the wing will descend. If the force is adequate the block should rise. If it does, then 45 kilos of lift have been generated by the figure and 45 kilos by the wing - two wings of this size would therefore lift a man into flight. Leonardo acknowledges that the force needs to be applied rapidly, and the speed of the figure’s movements is nicely conveyed in the drawing by his lively footwork and flying scarf. Leonardo’s concluding remark seems to indicate that he sensed the futility of his experiment. In reality, the energy required for a man to flap two such wings would be well in excess of double the force necessary to beat down one. If you want to see the true proof of the wings, make a wing out of paper, using a framework out of canes and master canes, for a width and length of at least 20 braccia. And fix it over a heavy board weighing two hundred pounds, and make a rapid force, as shown above. And if the board lifts up before the wing lowers, the proof is good. But make it so that the force is swift, and if this effect does not succeed, do not lose more time with it.